Raspberry No-Bake Cheesecake is the perfect summer dessert! Topped with Blueberry Sauce, it’s also a great option for all of the red, white, and blue celebrations as well! I love all cheesecake. All of it. But, I especially love a good no-bake cheesecake recipe in the summer. When it’s too hot to fire up the oven, cool desserts are the way to go! Especially cool dessert with fresh summer berries! This Raspberry No-Bake Cheesecake also makes a great patriotic dessert for Memorial Day, the 4th of July, and Labor Day! 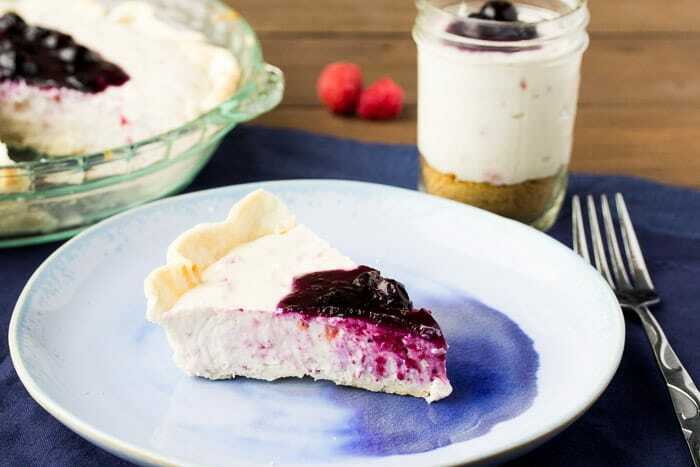 The raspberries give a pretty red swirl to the cheesecake and the blueberries on top are obviously the blue in this red, white, and blue recipe! This cheesecake is quick to make and can be used in a variety of ways. In the recipe below, I will show you two different ways that I love to enjoy this delicious treat! Set your cream cheese out to come to room temperature before you begin. 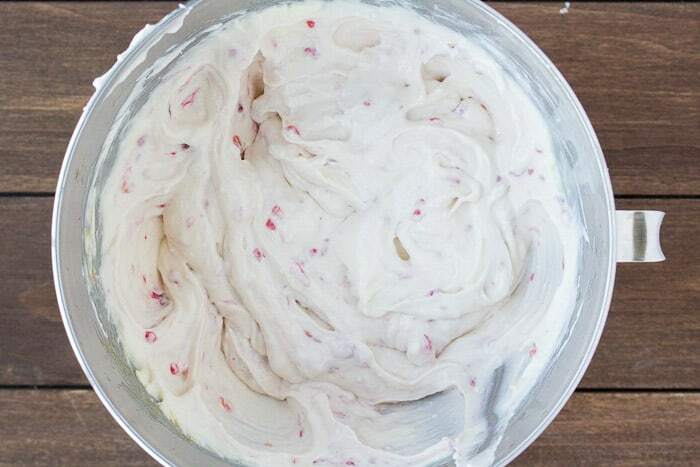 In the bowl of an electric mixer, beat the cream cheese on low speed. Slowly add the sweetened condensed milk, lemon juice, vanilla extract, and non-flavored gelatin. Once everything is well combined, add the raspberries while continuing to mix on low. Once they are broken up and blended in evenly, turn off the mixer. To make the blueberry sauce, add all of the ingredients to a sauce pan and bring to a boil. Reduce the heat and simmer for about 6-8 minutes. 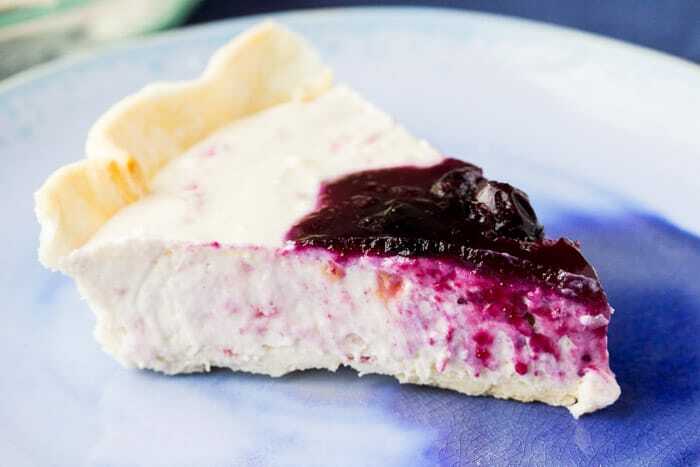 The blueberry sauce can be made ahead of time, but I would recommend warming it up some to make it easier to pour over the cheesecake when you are ready to use it. You can use this raspberry cheesecake in a variety of ways. One simple way is to bake a pie crust, let it cool, then pour the cheesecake into the crust. Refrigerate for 2-3 hours minimum, until set and chilled, before serving. You can also use a store bought graham cracker crust to avoid having to turn on the oven and to keep this recipe truly no-bake! Another fun way to use this no-bake cheesecake is to make individual servings. You can do this in mini pie crusts that you can buy at the store, or in mason jars. I took plain graham crackers and crushed them into fine crumbles. I put the crumbles into the bottom of the mason jars, then added the cheesecake, and topped them with the blueberry sauce. Kids love these! Love this Raspberry No-Bake Cheesecake recipe? Follow us on Pinterest, Instagram, and Facebook for more! 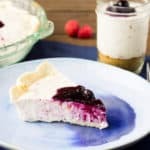 No-Bake Raspberry Cheesecake topped with a homemade Blueberry Sauce is the perfect summer dessert! You can make a full pie by using a pre-made pie shell, or make fun individual servings in mason jars. Add the cream cheese to the bowl of an electric mixer and beat on low speed. Gradually add the sweetened condensed milk, lemon juice, vanilla extract, and the packet of non-flavored gelatin. Once everything is full combined, add the raspberries. Beat until the raspberries are broken up and blended in evenly. Either pour the cheesecake batter into a pre-cooked pie crust, store-bought graham cracker crust, or mini pie crusts. 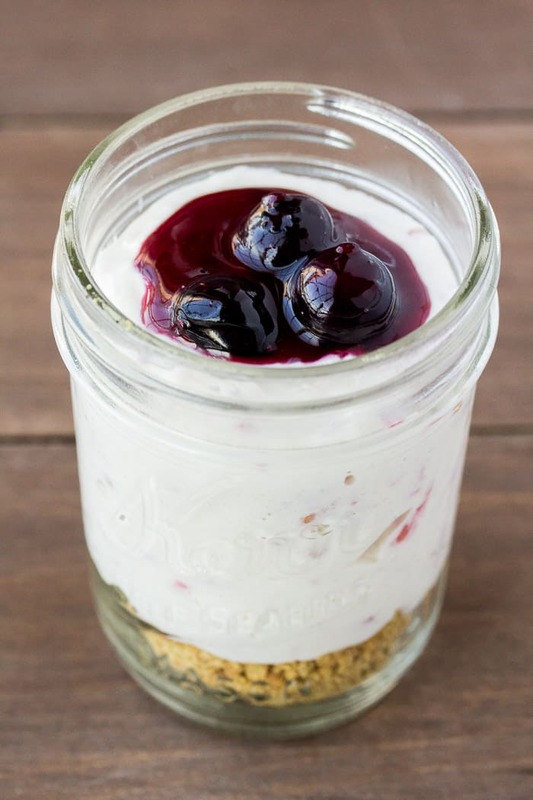 You can also crush up graham crackers to put in the bottom of mason jars, then top those with the cheesecake batter. Refrigerate for 2-3 hours minimum, until set. 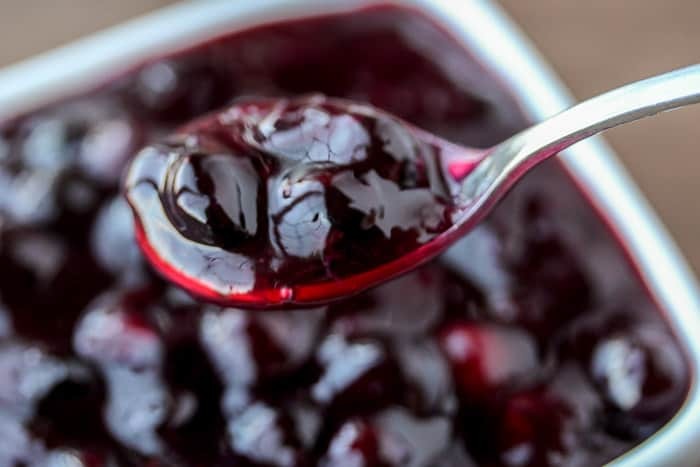 To make the blueberry sauce, add of the ingredients for the sauce into a saucepan and bring to a boil, while whisking occasionally. Lower the heat and simmer for 6-8 minutes, until the desired thickness is achieved. Pour or spoon the blueberry sauce over the cheesecake(s). Set your cream cheese out about an hour before you begin to allow it time to come to room temperature. The blueberry sauce can be made ahead of time. It is strongly recommended to warm it up some to make it easier to pour over the cheesecake when you are ready to use it. Use a pre-made graham cracker crust or graham cracker crumbs to keep this recipe entirely no-bake. How long does No-Bake Cheesecake keep in the refrigerator? You can store extra cheesecake in the refrigerator, tightly covered with plastic wrap, for up to 5 days. Can you freeze No-Bake Cheesecake? Yes. Allow the cheesecake to cool then wrap it tightly in plastic wrap. You can wrap it whole or cut it into individual servings. Use within 1 month for best results. ** Nutritional information is only an estimate and may vary. Pie crust is not part of the nutritional information as it will vary depending on which method you choose to use. This is my kind of dessert! I love raspberry cheesecake, and blueberry sauce makes me swoon. Great combo! Thanks Andrea! Mixing berries always seems to work out great! I am all about cheesecake this summer! This easy blueberry one looks so good, pass me a spoon. Oh be still my heart…cheesecake and berries? I’m in heaven with this lovely cheesecake recipe. yessss! This is the perfect recipe for me. Looks VERY tasty! I’m sure this is incredibly delicious! Love everything about this recipe! THANK YOU! I have two large blueberry bushes in my yard about to be covered in berries…guess what’s nest on my todo list! This recipe looks so delicious, i can’t wait to try it! I’m so jealous of your homegrown blueberries! I have a small garden, but no berries yet 🙁 Hope you love the recipe!